Time Sheet Weekly is an important tool to manage work timesheet, our Weekly Timesheet software allows to manage timesheet as well as time tracking. Our Online Weekly Timesheet software is designed to ensure enterprises to a seamless, secure, and painless tracking of their employee attendance management and project timing – thus enabling them to save hours in such a smart way that addresses their work style and help them carrying our works flawlessly and more smoothly. Weekly Timesheet Software simple, easier and low cost for small and local businesses. Easily affordable Weekly Timesheet Software Online available today. Do you prefer to track time for the entire week straight away? We have the right solution for you! Our Online weekly time tracking software interface allows you to easily and quickly enter your timing and hours for multiple tasks and monitor them simultaneously at the end of the week; instead of wasting time on a daily basis. Easy timesheet monitoring, quick import, and export of timesheet data, and real-time results – our We have Timesheet Software has it all for you! The idea to create high-end Online Weekly Time Tracking Software came from the personal needs of the managing director of Business Integration Software Ltd (BIS)! The only mission of BIS is to provide businesses with a better way to monitor and manage their project timing, employee timing, and payroll skills digitally and effortlessly. Here, you can get the best timesheet software systems, be it daily, weekly or monthly – with compatibility for multiple browsers and OS like Linux, Windows, Android, and Mac. Save Your Time, Money, & With Our Weekly Timesheet Software! Online Weekly Timesheet Software is flexible, super-secure, and synchronized! You can easily create tasks as well as long time wherever you need it, without making any jump through the hoops like developing tasks at one place and then tracking the time in another! Just keep all these hurdles and enjoy a hassle-free and quick monitoring and tracing of the timing of your staffs and projects on a weekly basis with our Weekly Timesheet Software! Enjoy Easy, Smooth, & Real-Time Online Weekly Time Tracking! Our weekly timesheet software is intended to allow you all the seamless and smooth tracking functionalities that you need to streamline the performance of your business projects, to calculate your task time, and to export your timesheet data in your desired format. From the same window; you can record multiple time entries and leave notes easily. You can also optimize the view of our software system for more focused work. The best part is you even can download your weekly timesheet in PDF format; whenever you need it to present it to your manager offline. Our Online Weekly Timesheet Software records the start-timing and end-timing of tasks alongside the date so that you can easily trace your work efficiency and invested time for every project. Our Online Weekly Time Tracking Software system contains a detailed breakdown system which logs the timing of each task systematically and throughout the project. You can record each bit of details and track them all from a single panel, on regular, weekly, or even monthly basis. You can also log the timing of the tasks daily or weekly or monthly, based on the nature and requirements of your project. Online Weekly Time Tracking Software provides time to track history with employee time tracking status when an employee submits their timesheet, the line manager gets a notification for the timesheet via email. Employee Monthly Timesheets can be generated using weekly timesheets with ease. Our software persists as weekly timesheets but the project resource calculator and payroll accumulate on the monthly basis and provides human resources information on a monthly basis. Small Business Weekly Time Tracking Software online gives full coverage of all projects, resources and time tracking activities along with time card. All this information makes the payment simpler. Monitoring is very critical for administrator and managers where business updates are essential to real-time and require in zero time. We have built this fully available system with no delay and zero maintenance time and operates seamlessly. Employee Weekly Time Tracker makes it manageable as the effort is only for seven days and does not require intense resource. Historical weekly time tracking is crucial to anyone and we have build time tracking database to enable the organization to process and provide valuable historic tracking information with the management. 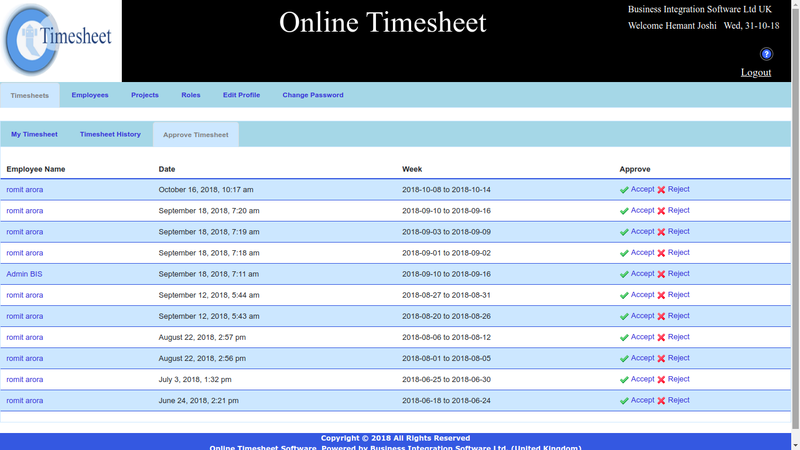 Our Work Timesheet Software provides a simple user-friendly interface line managers, employees and administrators. Line manager can view the own team members timesheet and take appropriate action. For instance, approve work timesheet or reject work timesheet in case of work timesheet is rejected, a Timesheet team member can recheck and resubmit the timesheet again. Online Work Timesheet Software provides a detailed report of working hours with project details, so management can see the employees working hours with current running projects details. Online Work Timesheet Software provides timesheet history with employee timesheet status when an employee submits their timesheet, the line manager is notified for the timesheet approval via an email. Work Timesheet can be submitted on week by week basis or when the organization requires. It is totally configurable and manageable. Work Timesheet is an important part of business cost calculation, bear this in mind our work timesheet is designed from the start with built-in project cost or resource cost timesheet calculators and analysis panel. Our Work Timesheet analysis process along with the analysis panels provides full cost calculation per employee and overall cost of the project. Executive and Managers can keep track (Time keeper software) of the work cost and operate within the allocated budget. Our Time Sheet Weekly Software provides the details of projects, resources, time information and other time tracking related information. With our Time Sheet Weekly, the employee can submit time sheet on any day of the week including weekends also employee can submit the timesheet on weekly basis. An employee just needs to select month and year after selecting a month and year need to select week for timesheet and inserting weekly work details and submit the timesheet. 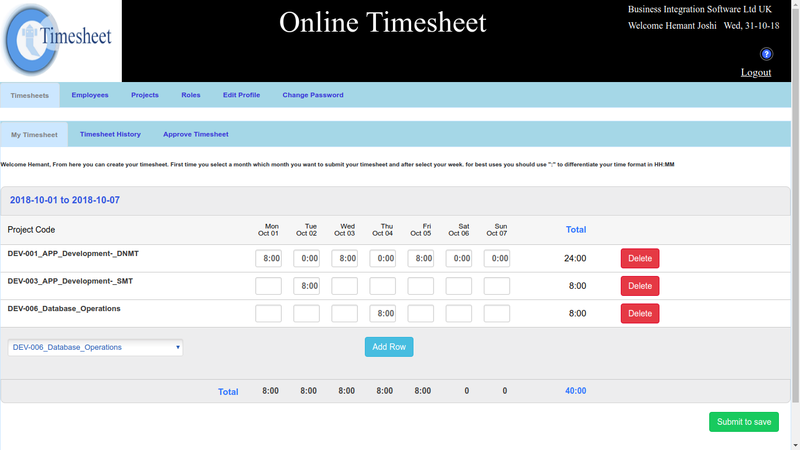 Our time sheet works online and employee can fill the time sheet details and submit online without being in the office. All-Time Sheet entries are designed with the weekly concept allowing any number of project or task entries as required to commit and justify working hours. All timesheet details are validated by the business rules and instant action is taken without persisting it to the timesheet database. Time Sheet weekly interface is straightforward and even novice user can operate on it. Time Sheet serves two purposes one to track employees record and other to provide senior management for running the cost of an organization or a business. A justification is required for a number of hours worked, we have authenticator software which uses two-factor authentications to ensure that the right employee is submitting timesheet and its destination or approval manager is one which is designated to the project. Designated line manager has the approval email which needs to be approved or rejected. Upon rejection whole process is re-initiated until rectification takes place. As audit demands and also requires for evaluation purposes all historical Weekly Time Sheet needs to be archived and made available all the time. Our Time Sheet historical database maintains current and all the previous records and can be monitored and tracked online. Our Time Sheet Software is web-based and provides 24 hours with day support.